Right wrong, wrong right. Puzzled! Disclaimer : This article doesn't intend to hurt any person's religious feelings, any community, country or people. He sacrificed his brothers, sons, his entire kingdom and even his own life for the sake of his sister's pride! He abducted someone's wife and imprisoned her for several years. You are correct, I am talking about Ravan. The other day, during a conversation, someone gave me the example of Ravan to define evil. Ravan is regarded as "wrong". Beyond any doubt, he should be, cause this is how he is being portrayed in the epic and subsequently in all the TV shows. For a moment, if you keep aside ethics and rectify the fact that he must have been "right" on his part!? After all, every girl in the contemporary world needs a brother like him. And every wife needs a husband who doesn't touch a woman without her consent. 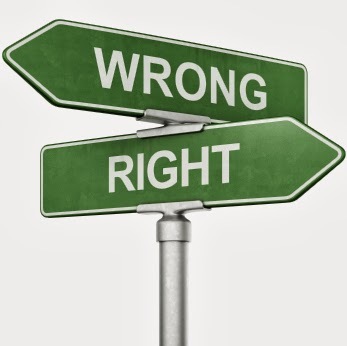 Aren't right and wrong convertible terms, depending upon popular opinion? I believe that right vs. wrong is a psyche that is primarily gained one's emotions and social experiences. Many feel it is RIGHT to smoke and consume alcohol, whereas several others find it to be WRONG. Marrying someone of choice sounds RIGHT to some, but may be WRONG decision from the perspective of many. Committing suicide may seem RIGHT and easy option by a handful of people. On the contrary, it is perceived to be a WRONG decision by most. Some believe war and/or revenge is the RIGHT way, others believe peace and communion may solve an issue. I like your way of thinking. I have been thinking the same for a while of course I was not thinking about Ravana but right and wrong in general.